Before you get to stuff like default time period or timeline navigation, make sure you have all the timeline settings set to how you want them to be. You can adjust the coloring for the holidays and non-working days, choose between different date and time formats, and change days and hours displayed in the Gantt chart area etc. Timeline settings apply to all users by default, not only to the administrator that is applying them. You'll find the 'SETTINGS' icon on the sidebar. It will open automatically if you haven't changed any settings during your current session. The time settings you select will be applied to the entire account, every administrator and user will see them. The changes you have made will be applied. 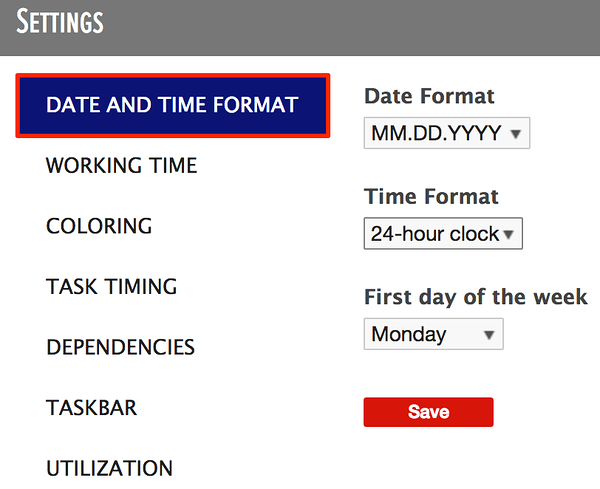 This will allow you to view the current working time settings. Click on 'Save' once you are done. 1. Toggle the switch to enable business days. Green stands for enabled. The days that you exclude won't be included in utilization calculations. You can overwrite the general business days for each resource to add resource specific business days if you need to. 2. Set the days that are displayed in the Gantt chart area. Green stands for enabled. 3. Set the general business hours. You can add breaks for lunch etc. 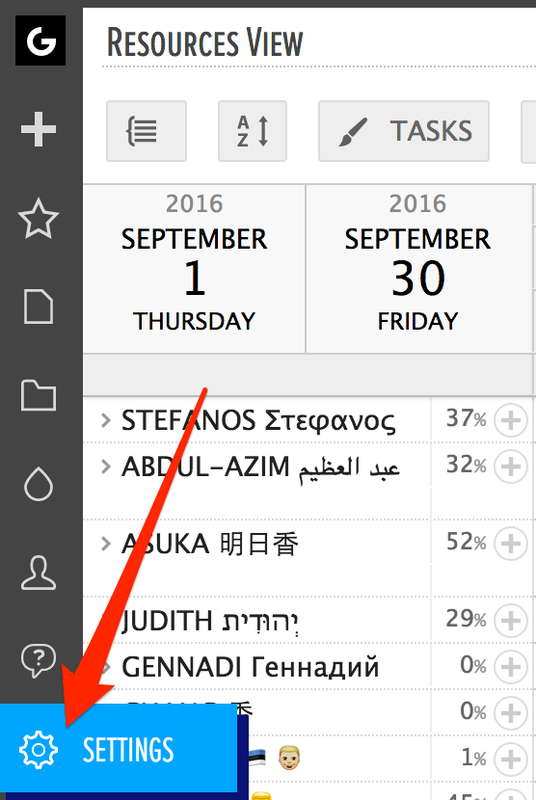 Again, like business days, you can set individual business hours for each resource separately if there are any exceptions to the rule. 4. Select the hours that should be displayed in the Gantt chart area. 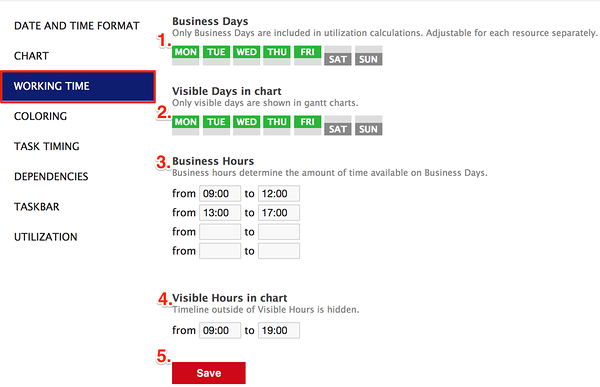 You can set the visible hours to be the same as business hours but do note that visible hours can't be edited per resource. You'll find it in the menu. 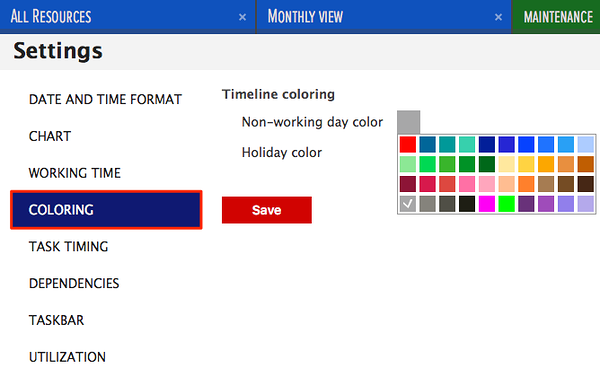 The colors will be used to mark the non-working days and holidays in the Gantt chart area. The changes you made will be applied. Did not find the answer to your question regarding the timeline settings?